It's an active compound derived from Lupinus Albus (White Lupin). It is rich in peptides, vitamins and nutrients and has powerful effects on slowing down hair loss and stimulating growth. As hair follicles become active and move into the growth (anagen) phase they have a hugely increased need for nutrients supplied by the small blood vessels around the root. The body responds to this need by producing growth factor chemicals that stimulate the formation and permeability of these capillary blood vessels. This ensure a full supply of nutrients for efficient hair production. Pro-Anagex has been shown to increase the productions of these important growth factors and increase the density of blood vessels around the hair follicle. Once the hair follicles become active, cell growth and division is essential for hair to form and grow. Keratin is produced at the root and hardens the hair leading to cell death,, but continued new growth at the base pushes out this dead hair. Pro-Anagex provides peptides and trace elements (especially Zinc and Iron) that stimulate this metabolic process and boosts keratin production so ensuring stronger, thicker hair growth. 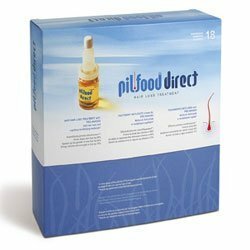 Pil-Food Direct has been tested under dermatological control. No colourants added. It does not make your hair greasy and it dries quickly too! http://pharmamundi.com/Backsite/index.php?entity=product&operation=show&idProduct=1676A new anti-hair loss treatment from the makers of Pil-Food supplement. Pro-Anagex to help you combat hair loss and promote new growth.